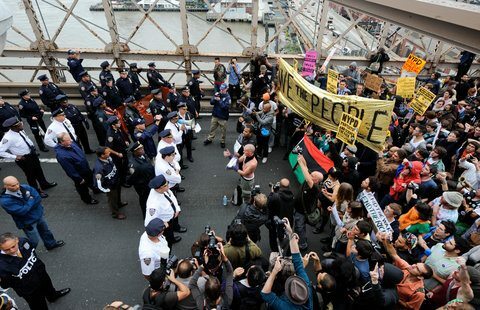 NYC Police and demonstrators on Brooklyn Bridge before 700 arrests. Oct 1, 2011. There is so much going on right now all over the country (and world?) about these “Occupy” actions, it’s getting difficult to keep up. So, for right now, I’m posting links to interesting stuff involving these events. And I’m constantly updating these reports. Occupy Tijuana has a facebook. 700+ Arrested on Brooklyn Bridge – Saturday Oct 1; most were cited and released. The Occupation at Liberty Plaza continues, with 800 people in the downtown financial district. 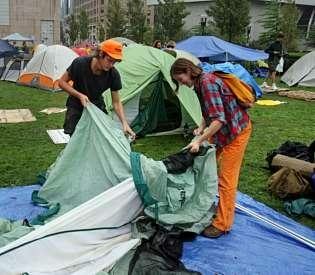 Occupy Boston ; Friday night a crowd of 1,000; occupation in front of Federal Reserve Bank continues despite rain. Toronto, Canada – Activists are planning an occupation of Toronto’s financial district, following in the footsteps of protesters currently camped out on Wall Street. A group calling itself Occupy Toronto Market Exchange has launched a website to organize a march on Bay Street beginning Oct. 15. About 830 people on Facebook have replied they would attend the event in Toronto. Occupations are also planned in the streets in other Canadian cities, including Vancouver, Montreal and Calgary. 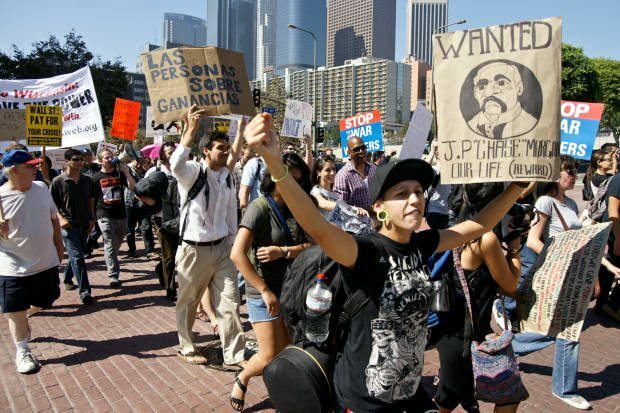 To find out what other cities are doing around the country, go to occupy together. Many locales are planning actions on October 15th. Occupy Tokyo is organizing a facebook page. Many cities and countries have budding movements in solidarity. I think all of this will provide finger moving for the iPhone people, but otherwise not accomplish a heck of a lot. Remember the BUMS in the congress and senate still get their pay and still have the power to give themselves a raise. So far there is no evidence that any super rich Americans are worried about any of this changing their life style. I don’t know about the rest of you, but that’s best endorsement I’ve heard yet. Yup. Now that OccupySD is limited to 100 tents, there’s been discussion of an OccupyKrvaric movement. Tony Krvaric’s business, Krvaric Capital, and the Republican Party of San Diego County are one in the same – a twofer for the OccupyKrvaric movement! what are we waiting for! where is san diegos stock exchange or financial district. publish a meeting place and i’ll see all of you there!!!! hey dave… glad you’re interested. Start with this link http://obrag.org/?p=46145 for the San Diego Occupy info. If you want to donate to OWC, here is a link to what they need and what you can do. There is a UPS store close by where non-perishables and money orders can be sent. There are also local restaurants and pizzerias (yes, there is an Occu-pie) which are accepting donations and delivering food. There are ways to help OccupySanDiego as well, and as soon as the details are worked out we will post them. Looking forward to learn more about how we can all help. Thank God, we have a new generation of youth taking to the streets to confront injustice and war. Those of us who are seasoned leftys and power liberals must stay away from the microphones, stages and media cameras, in spite of our reflexive ego stroking, this week-end and let the youth of our city not only articulate the future of their movement, but allow them to lead us timid reformists into confrontation and civil disobedience, even arrests. It is the only way to build solidarity across generations and economic classes, the only basis for true revoluntionay change and the only way we are going to find the collective courage to dis-engage ourselves from the U.S. Empire. You must be proud of protestor yelling “Shame” repeatedly to NYPD police officer. Good on you. Thanks, Frank, for putting all this info in one place. You also did this type of thing during past elections and I appreciated it then too! It’s bigger than just Wall Street in New York, or C Street in San Diego. It’s about how this world’s economy is to be organized in the future, because enough of us, regardless of political affiliation, can see where things are going now and simply won’t allow it to happen without a fight.